The night before we left for the Nki National Park, in the southeast of Cameroon, we sat at table for a late supper and listened to alluring but frightening stories about animals, especially elephants. The setting was Ndongo, in Moloudou Subdivision on the banks of the Dja River. O ur storyteller, Dr. Leonard Usongo, World Wide Fund for Nature, WWF, Project Coordinator for the Jengi Project, interspersed his lyrical narratives with knowledge of animal behaviour in the wilds. "When you meet an elephant, its first instinct is to go away. The elephant is a very shy animal," he said.As the night grew older, the stories became scarier. What about this snake poacher who got stung to death by a mamba snake? The expert who almost got killed by a poorly tagged elephant and the ability of the Bakas, inhabitants of the evergreen forest in the East Province of Cameroon, to climb up trees like monkeys when a tagged elephant is administered an antidote? Dr. Usongo's stories kept the night going, especially as Pieter Stemerding, Manager of International Projects, WWF Netherlands and Dr. Henk Middelbrink, Head of ICT, showed sustained interest. However, some people, like your correspondent, went to bed terrified. The next morning, we set sail for the Nki National Park, on board a motor-driven canoe. The boatman, Bonaventure Motoumawe, coursed through the slow flowing River Dja, causing the canoe to swing right and then left. Desiré Dontego, Forest Assistant in Nki, was a superb cook. He served coffee in the canoe. As we sailed along the Dja River on the borders with Congo Brazzaville, we began viewing the picturesque beauty of the Nki forest, declared national park last year. The virgin forest was radiating with wildlife. We saw different species of birds warbling on tree branches. Then we saw a crocodile. But within seconds it had disappeared into the belly of the river. The monkeys leapt and swung freely in the trees, oblivious of the revving canoe engine. As the rapids impeded the canoe, we saw a huge track that ate into the forest. "That passage you see there was left by an elephant," Usongo said. He pointed to the footprints of elephants along the banks of the river. For one thing, there are about 5000 elephants in Boumba Bek and Nki with a density of about 2.5 per km2, according to studies carried out by various researchers. Enthralled by the striking beauty of the forest, and the numerous birds and animals we were delighted to see, we could barely realise that we had already spent over four hours in the river. After searching for a place to camp along the river banks, we finally bivouacked on a small island half the size of a football field before heading for the Nki Falls. Here, the finery falls of the river gave a tinge of exoticism to the landscape. Thirty minutes, and lunch, generously served by Desiré, was over. We headed back to the Island, as dark clouds betokened rain. It began raining 45 minutes after we set foot on the Island. We retreated in our tents. But the downpour was accompanied by strong winds that blew away a tent. The rains, however, ceased as darkness blanketed the "Island of Storm", a name crafted by Peter Ngea Beng, WWF Regional Communication Manager for Central Africa. As we sat around a fire that evening, Desire prepared supper while we struggled to keep ourselves dry. Dr. Usongo kept splitting banters as Pieter fished nearby. At least, he succeeded in catching a fish, which was fried and eaten same night. Despite the caprice of the weather, we could still savour the splendour of the night. The trees, from a distance, seemed to kiss the unpredictable sky. The insects kept buzzing. One could hear the trumpeting of elephants far, far away. We felt the languor of the gentle river, with its silver surface. Nevertheless, by midnight everybody was in his or her tent, some already snoring. Dawn came but the weather remained inclement. A visit to the Nki Bai (forest clearing) revealed fresh footprints of elephants. These giants of the forest had once again eluded their curious friends. It began drizzling. We boarded the canoe en route to Ndongo. This time the journey lasted four hours. Only four hours. But our admiration for the Nki Park heightened as we sailed away. It was like a visit to dreamland, which might disappear anytime conservationists begin to relent their efforts to maintain the virginity of the Nki Forest. Nice story, It is really pleasurable to hear that such nice places still exist on our planet despite the advances of timber hunters and poachers. conservationists, all my encouragements to you! Just got back from the Nki Falls last Friday. We heard the roar of an enormous animal in the river, which our guides said was a Mokele-mbembe. 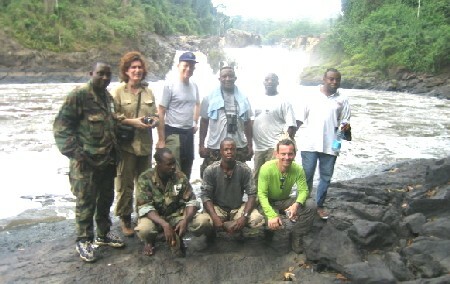 We had heard that the animals were in that area, and we even interviewed a few fishermen at N'Dongo who have seen them. We also saw monkeys, crocs and elephants, but no hippos. They are absent where Mokele-mbembes are present apparently. Hopefully, we'll head back there next year!